Vegetarians, avert your eyes. This post is about tender, juicy, melt-in-your-mouth meaty goodness. I knew I had to share the recipe when the first words out of my son’s mouth after one bite were, “Please tell me you made enough for leftovers!”. It is incredibly easy – heat and time do all of the hard work in either a slow cooker or a cast iron dutch oven (I used my dutch oven). If using a cast iron dutch oven, preheat oven to 350 degrees. Place the ancho chiles and the unpeeled garlic cloves in a bowl with 3 tablespoons of water and microwave on high for 2-3 minutes, or until soft. Remove the stems and seeds from the chiles and the skins from the garlic and place in a blender. Add chipotles, chopped onion, 2 tablespoons olive oil, honey, vinegar, 1 tablespoon of salt and oregano to the blender. Puree until smooth. Add remaining tablespoon of olive oil to a large skillet if using a slow cooker, or directly to your dutch oven . Heat oil over medium-high heat and add the pureed chile sauce. Cook, stirring frequently, until thickened – about 8 minutes. Add the chicken broth and cook until slightly reduced – about 10 minutes. Sprinkle pork with salt and pepper. 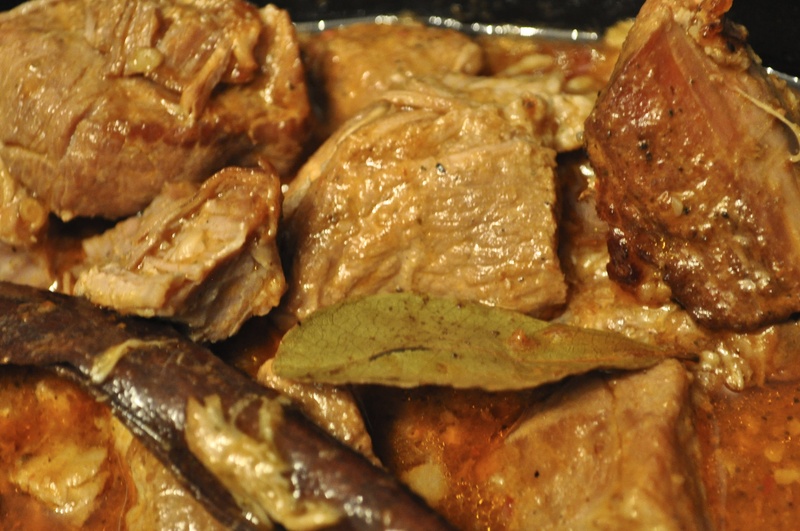 If using a slow cooker: add pork, cinnamon stick and bay leaves to slow cooker then pour in the sauce, cover, and cook on high for 5 hours or until tender. If using dutch oven: add cinnamon stick, bay leaves and pork to the sauce in the dutch oven, stir, and cook covered at 350 degrees for 1 hour and 45 minutes and uncovered for 30 more minutes. Remove cinnamon stick, bay leaves, and any remaining fat from pork (this will be obvious and will come off easily with a spoon). Skim fat from top. 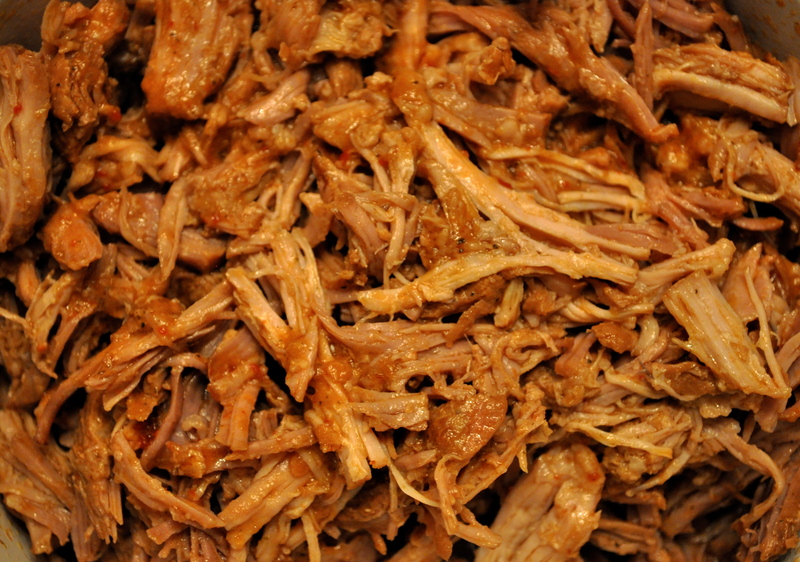 Shred pork with two forks, stir to coat with sauce, taste for seasoning and add salt and pepper if needed. 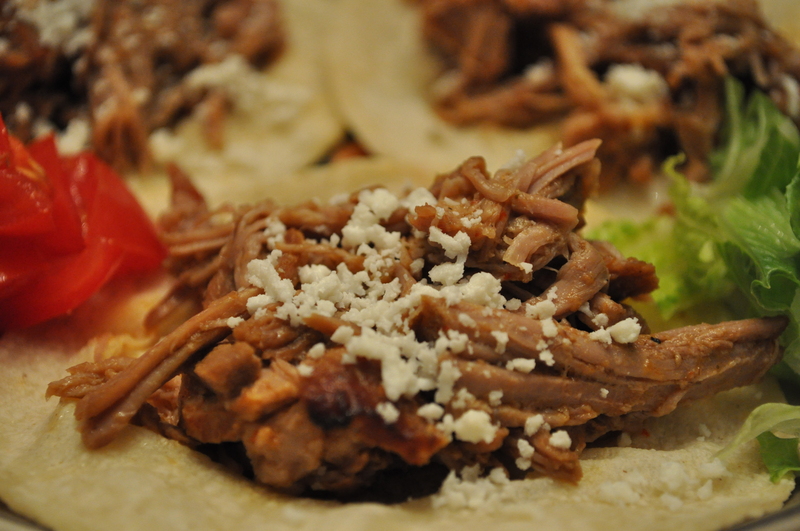 Warm corn tortillas in microwave covered with a damp paper towel for several seconds and serve with pork and toppings. I’m making more seitan (wheat meat- not for you my gluten free friend) and I’ve wanted to try it in a “pulled pork” kinda way. I’ll try this reciepe vegan-style and let you know how it turns out. But first I’m going for BBQ sandwiches! Please do let me know how it turns out! I have several vegan/vegetarian friends who would love to know. I’d also love to hear about the barbecue sandwiches! I do a very similar recipe with one twist: final step is to spread the meat and some juices on a foil lined baking sheet and pop it in the broiler for 4 minutes. It crates the most increadile meaty caramel goodness! I will try that next time – sounds AMAZING!